There are many disadvantages to having a girlfriend who works most weekends (ah the perils of floristry and weddings!) but one advantage is that you become adept at entertaining yourself. One of the many pursuits I have embarked on to amuse myself is, what I call, aimless walking. It needs a better title, but put very simply it is just taking pleasure in walking through spaces, predominantly urban, with no set destination or deadline. I’m not the only one who sees merit in this. I mentioned in a previous blog the French Philosopher Frédéric Gros, who has written on the merits of walking and how lots of great Philosophers saw the merit in it. Unlike Gros’s, my own philosophy of walking is about the pleasure and stimulation of the city. Far from being an encounter with capitalist systems of “information, images and goods,” as Gros insists, urban walking in fact offers a million invitations to become anyone we want, totally for free. Personally, a long stretch of country leaves me as bored as a blank wall, which means I can’t quite regard what Gros is up to with anything other than awe mixed with skepticism, the way I think of people who make their own bacon. Impressive, but not for me. So, where am I going with this? 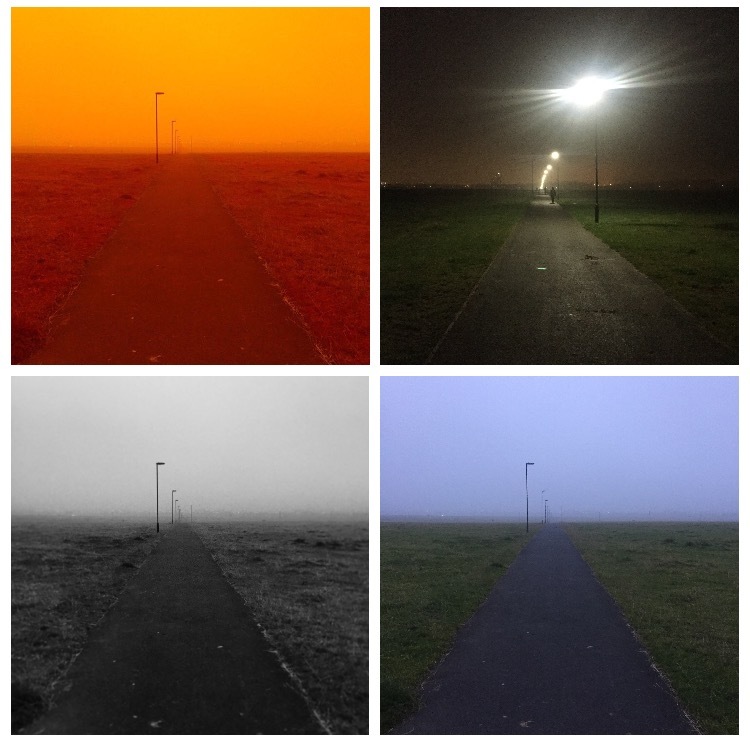 Well, it was whilst i was embarking on one of these aimless walks, that I got the inspiration for this weeks blog. I have had an ongoing project idea to work with a photographer to capture the now extinct sites of execution in Newcastle, it’s an interesting challenge as there is no real surviving remnants of any of the key sites. This project finally began in earnest last week, when a Sunderland University photographer contacted me to discuss the project idea. So, this gave me the perfect excuse to wander through Newcastle and perhaps manage a bit of research on the way! 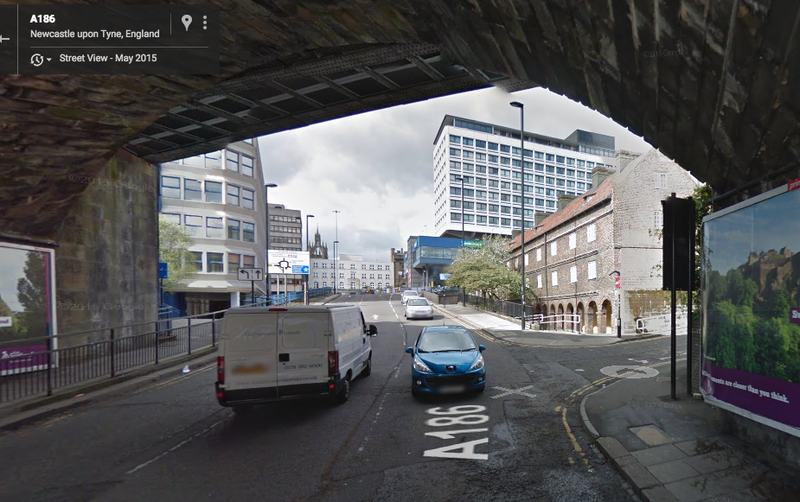 On Saturday I found myself wandering up from Newcastle’s Quayside and under the rail bridge, leading to Manors station, that crosses the road just before Pilgrim Street roundabout (see images below). As I was crossing I stopped to take a photo of what looked like a seemingly innocuous old white house and thought nothing more of it. The seemingly innocuous white house, that was more than it seemed. I then suddenly remembered that this was pretty much the exact site of the Barber Surgeons Hall, where the bodies of executed criminals would have been dissected pre 1832 as an additional punishment for the crime of murder. 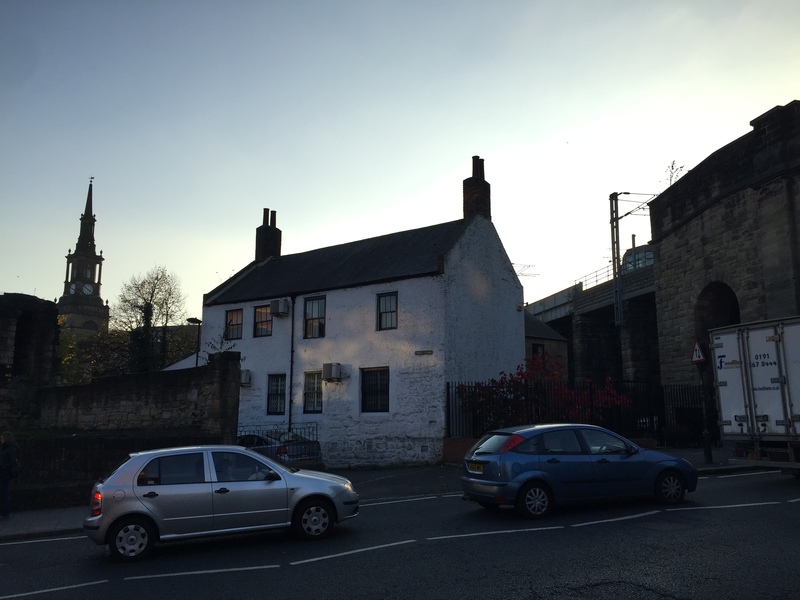 The Hall had been demolished in the mid c19th to make way for the railway bridge that would join Manors station, originally proposed in 1847. In fact the railway company built the Hall that was to replace it, in Rye Hill, as compensation. I realised that I’d never looked at an original map or plan of the site to pinpoint it, so I then set upon doing a quick bit of aimless walking research (brief mobile phone searches are allowed) and lo and behold, I found that this innocuous house was in fact the only surviving remnant of the Barber Surgeon’s Hall. It was the gardeners cottage. My appetite was whetted, so I started searching my sources on the Barber Surgeons’ Hall for references. I went straight to this early mention of the Hall in Henry Bourne’s history of Newcastle. Talking about the new proposed improvements to the Hall, he stated. It will shew (sic) the Hall and Gardens to some Advantage, but be rather too great an Ornament for such a dirty Part of the Town. There are besides this Square two other Garden’s for Herbs, which together with the Hall and Garden we have been speaking of, are attended by a Gardner, who lives there for that Purpose. Henry Bourne, The History of Newcastle Upon Tyne: Or, the Ancient and Present State of That Town. By the Late Henry Bourne, … (John White, 1736), 138. View from under the rail bridge, looking out to Pilgrim Street roundabout. On the right of the picture, the red brick building is the Holy Jesus Hospital, which has stood there for over 700 years. The Barber Surgeons’ Hall would have been roughly where I am as the photographer in this shot. 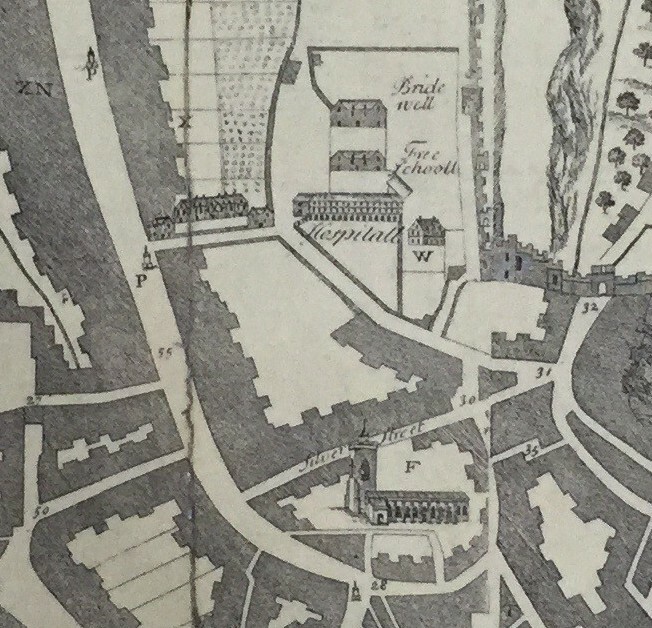 I decided to head to the Tyne and Wear Archives to see what older maps of Newcastle could tell me about the original site of the Barber Surgeons. I saw a 1736 map listed that was engraved by the Rev. Henry Bourne, the very same who provided the quote above, so I started there. The Hospital listed here is the Holy Jesus Hospital pictured above, to the right of the hospital, in the image, is a building marked W. This is Barber Surgeons Hall and the land immediately to the south of it was its gardens. 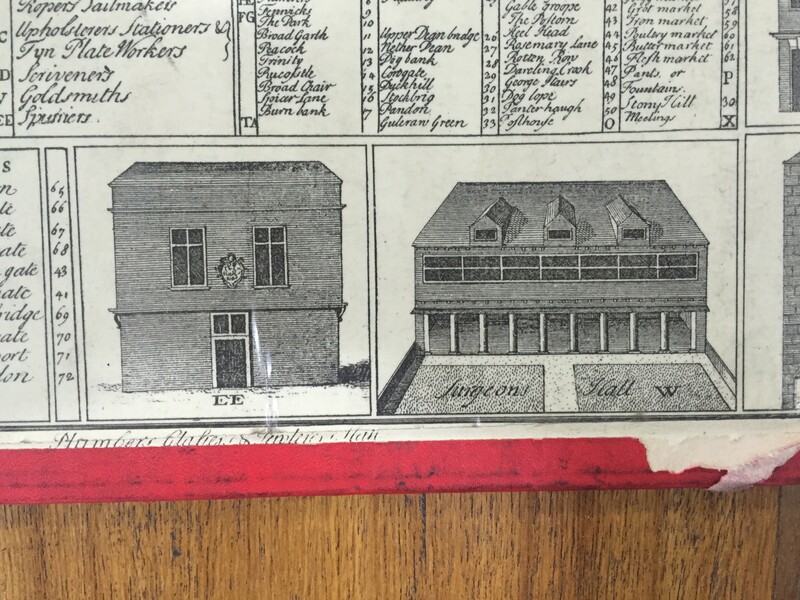 This map has the additional detail of a border with important buildings in the town and the Surgeon’s Hall is one of them. 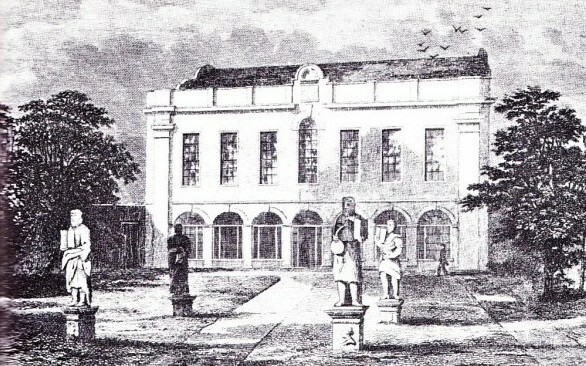 This image corresponds neatly with other surviving images of the Surgeons Hall, like the one below, showing the Hall when it had become the Newcastle School of Medicine, founded in 1834 – interestingly this was the same year that all post death punishments for the executed were removed (dissection had been removed by 1832, but gibbeting/hanging in chains wasn’t repealed until 1834 – in fact William Jobling’s gibbeting in Jarrow Slake was the second last in the country). Barber Surgeons Hall Newcastle on the Manors site. See what an aimless walk can do. Buoyed by this I decided to delve into the Barber Surgeons’ archive to see if there was much listed about the building being moved when the railway came. I soon stumbled upon this plan of the land the railway company required from the Barber Surgeons. 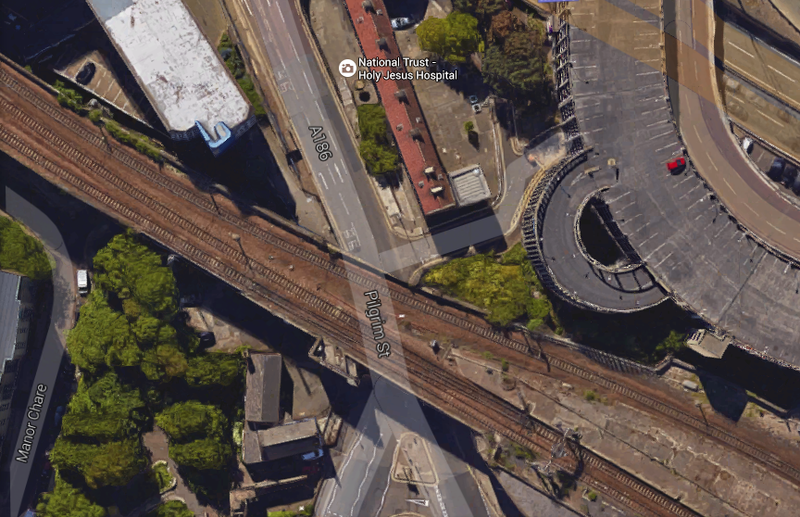 As you can see the bridge itself would have intersected the building completely, so it gives you a very good sense of the exact location when compared with a modern photo. 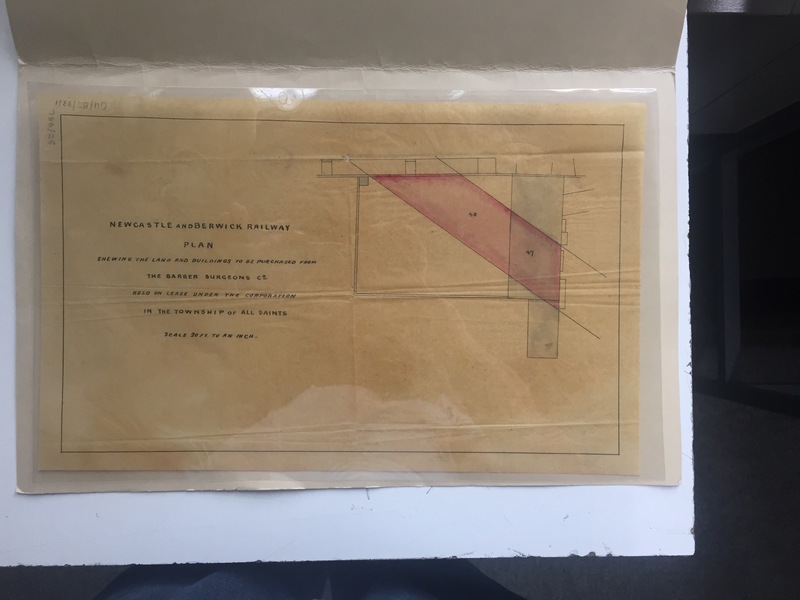 Newcastle and Berwick Railway Plan shewing (sic) the land to be purchased from the Barber Surgeons. A modern overview of the now extant Barber Surgeon’s Hall. To the bottom left of the picture you can see the roof of the, surviving, gardener’s cottage. The greenery around it may well be the remnants of the long established garden. Any plans I had of delving any deeper into the archives were quickly put to bed by the unexpected entrance of Judge Dredd, a Storm Trooper and a Dalek. I’m still not sure what they were doing there, but it saved me the bother of coming up with a satisfactory ending for this blog. So next time you’re in town, try a bit of aimless walking – you never know what you might find. 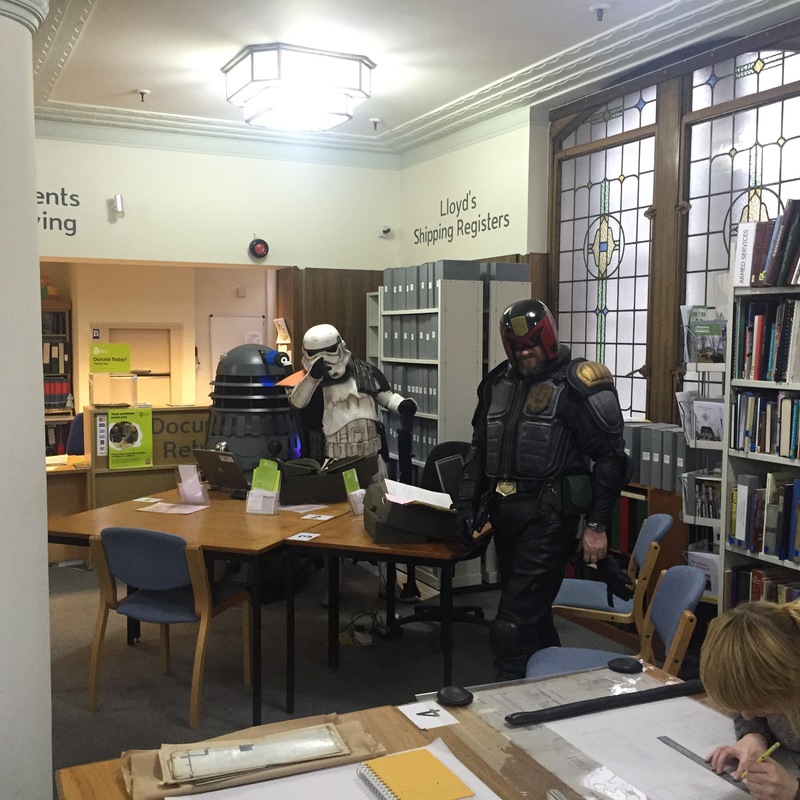 Judge Dredd, A Dalek and A stormtrooper all turned up in the Tyne and Wear Archive centre. I’m still not quite sure why. 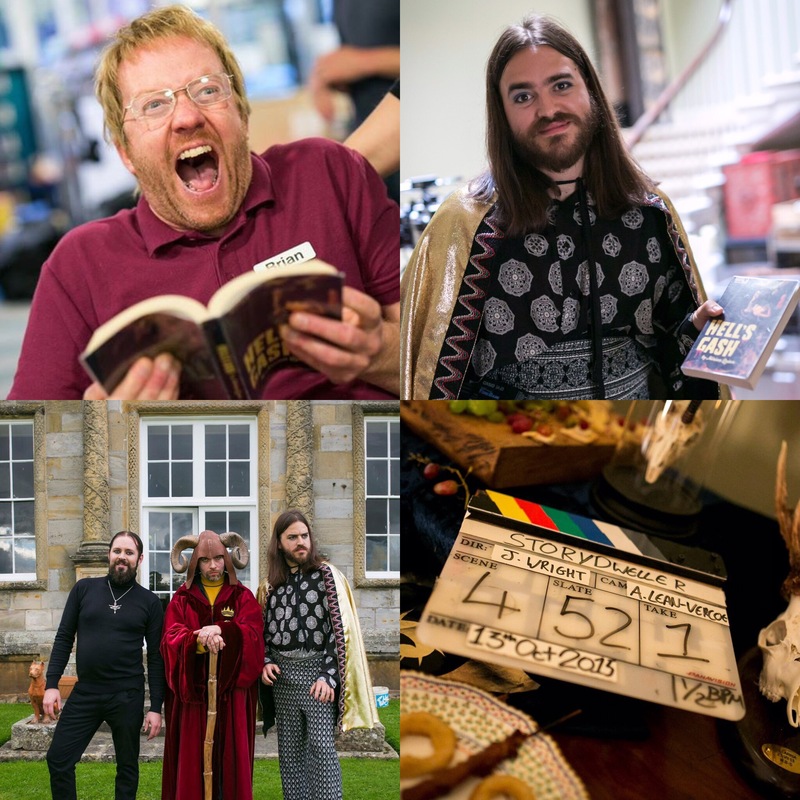 For long term followers of the blog, you will know that I have been filming a comedy pilot alongside my PhD. After months of prep and planning (the vast majority done by my comedy colleague Hal) we found ourselves finally filming it. It’s amazing to see something that you’ve worked so hard on come to life (the idea has been 3 years in the planning, after we won a Live Pitch competition in 2011). We filmed at various locations, but the highlight was filming at the beautiful Capheaton Hall. At one point there were, all told, 50 people on set, a goat (don’t ask!) and I was dressed like Rick Wakeman’s ugly cousin (see above), it’s not often you get to do that. I am part of a Pseudo Sciences of the Long Nineteenth Century Research group that meets at the Lit and Phil once a month and last night was our first meeting of the term. Dr Emily Alder, Edinburgh Napier, led a session on Author Edith Nesbit. 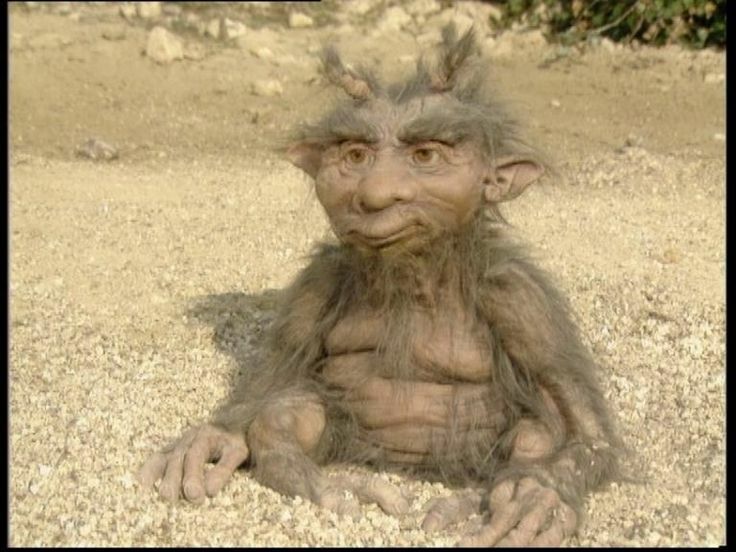 If you are anything like me you will know Nesbit for Five Children and It and the Railway Children – in my case it is the Samiad/sand fairy that springs to mind. I thought the line smacked of a Morrissey, Smiths era lyric. It was a fascinating night and I would recommend anyone interested to come along (there’s free wine for goodness sake). The next event is on December 2nd 6pm and is entitled Grotesqueries and Fashion: the Gothic Vagaries of the Regency ‘Gentleman’. I am including this simply because I haven’t had music on the blog for a while and this song has been in my head constantly. I was keen to use it in a scene for Storydweller but the powers that be (my two colleagues) have ruled agaisnt it. They’re usually right so i’ll let them have it, but they can’t stop me from putting it on here – enjoy, it’s a beauty.